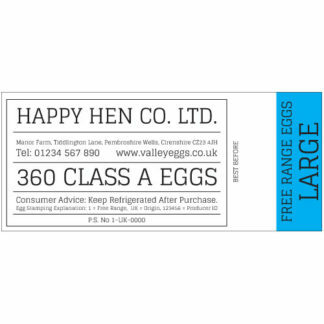 Egg Packing Outer Case Labels - Bespoke outer case labels to order! The Danro egg packing outer case labels are ideal for large volume suppliers to mark their boxes / cases. 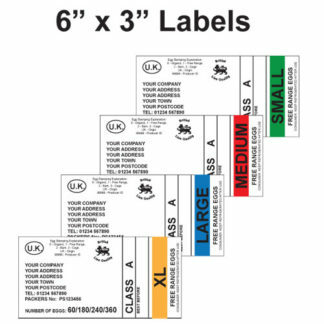 We manufacture a range of sizes and colours to assist with quick and easy identification of products. Egg packing outer case labels need to meet legal requirements for egg box labelling. These regulations are set out at both UK and EU level. If you are producing eggs or supplying eggs in quantities to warrant Egg packing outer case labels you will need to provide the Producer Id and a Packing Station Number. Both are supplied through the Animal and Plant Health Agency. 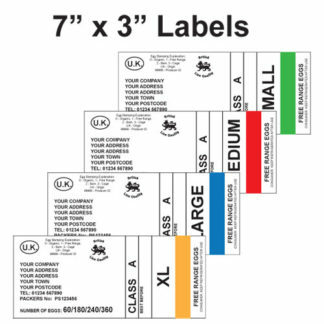 You can see from the designs below, we offer a range of sizes for egg packing outer case labels. We able to print in any colour or full colour if you require. You can add colour flashes to your outercase labels if you wish. These follow a generally accepted code of green for small eggs, red for medium, blue for large and orange or brown for large or very large eggs. This is a simple option when ordering and we will put the correct colour on your label. 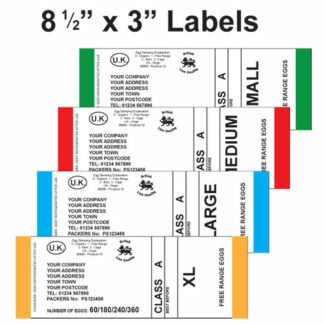 Your egg packing outer case labels are manufactured using our flexographic printing press so it is good to get marketing added when you order your first set. You are free to add other comments or marketing information such as phone numbers, logos, website address and quality or welfare assurance logos. We will prepare artwork for you and send it for confirmation prior to the printing process. 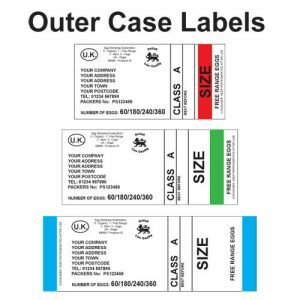 Danro have been manufacturing outer case labels for over 20 years so you can be assured you are in good hands. Call Natalie now on 01332 865933 or fill in a contact form and Natalie will call you back to discuss your order.